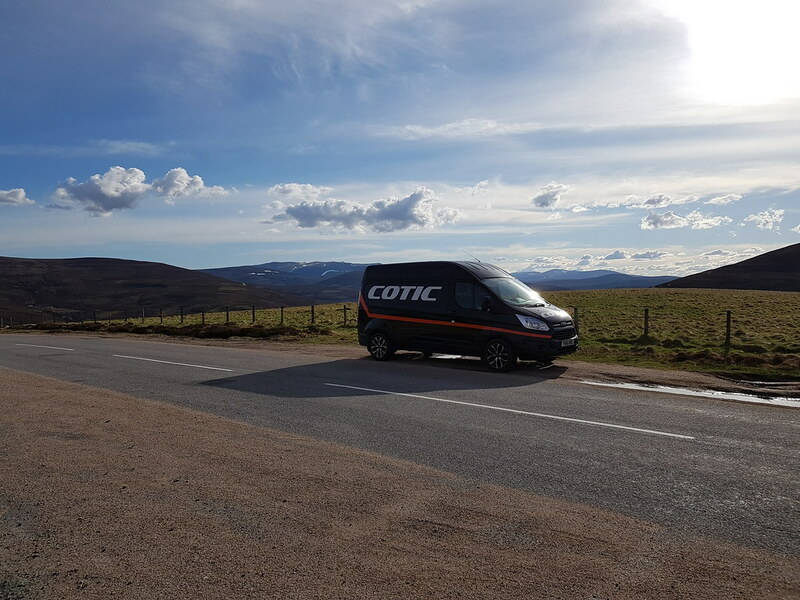 What a year it's been for Cotic, everything feels like it's stepped up a gear in 2018, especially the demos. We had some proper weather this year too, a long hard winter which included the need to boil a kettle to get a pedal off a bike, after the allen key slot had filled with water and frozen solid! However we were rewarded for our suffering through the longest winter ever, as this summer was a belter. Long, hot and dry days made for some of the best riding, all over the country. So many of you enjoyed demoing our bikes in perfect conditions, and I really enjoyed not having to clean the bikes for weeks on end. Although overshadowed by how awesome summer was, I think we've had a really good Autumn too. A dry, chilly day sliding around in the fallen leaves is hard to beat. Looking back over the year, it was hard to pick my favourite rides, but here's 5 trail highlights from 2018. What a place. The blue DH track is easily my favourite trail of the year, possibly my favourite ever. 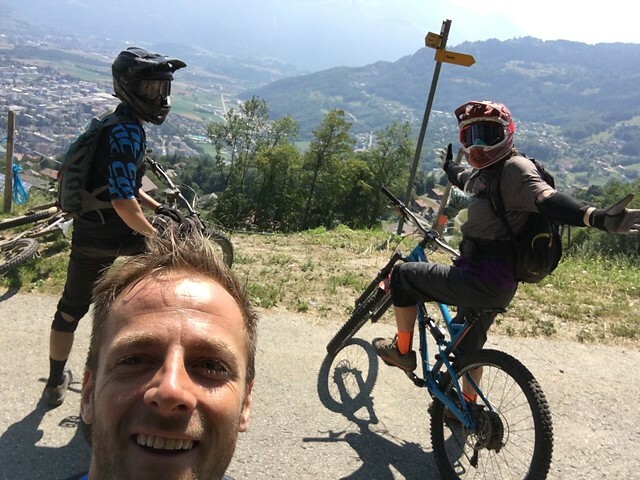 After a hectic long weekend racing the Megavalanche, which was an awesome experience; me, Rich and our mate Tom spent a couple of days chilling in St Jean d'Aulps just down the road from Morzine. 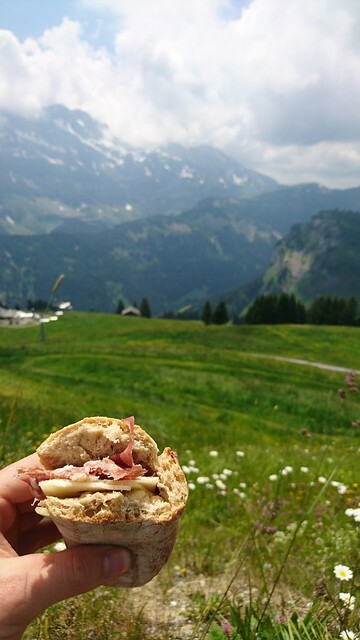 We drove over to Morgins, parked up, pedalled up a road for a bit then road a trail Tom had found while working a season over there previously. The trail dropped right down into the Swiss town of Monthey, and felt in places like a classic Peak District bridleway on steriods, finishing with a lovely stretch of singletrack littered with berms and jumps. 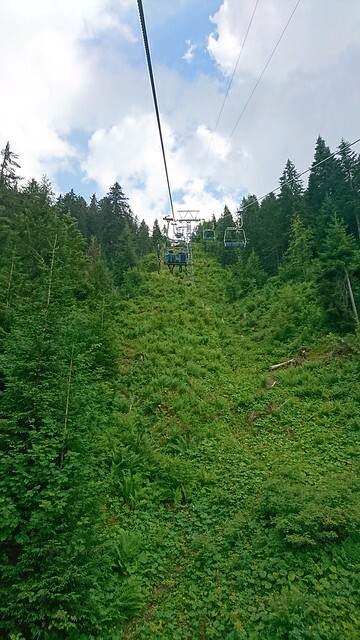 From there, we got a train up to Champery, bought a lift pass, got the telecabin up, rode a DH track into Le Crosets bowl, then descended on a mixture of fireroad and singletrack back to Morgins. This was great, but nothing compared to what we were about to ride. The Blue DH track there is rideable by pretty much anyone, but ridden at speed on a Rocket, was trail perfection. With boat loads of flow, each corner spat you precisely where you needed to be for the next, and there were root gaps and fade away jumps aplenty. The best part? Not a braking bump in sight. We didn't stop after the first run to exclaim how much fun we'd just had, instead we rolled straight onto the chairlift for another go, before practically screaming with joy at each other as we cruised through the treetops up the lift for more. If you ride one track in the Alps next summer, make it that one. Huge shout to the trail crew at Morgins, they've done an incredible job. Until April of this year, I'd never ridden at the Golfie. I'd heard nothing but amazing things about the place, but was blissfully unaware of the trail gold that lies in the hills above Innerleithen in Scotland. The Golfie Open Demo Day I ran in April marked the return of my excitement for riding bikes. The long, wet, snowy and generally difficult winter had gradually taken it's toll on me and my enjoyment of riding, not good for someone with my job. But that day I found my mojo again. The trails on the Golfie are a work of magic; steep, tight, fast in places, slow in others, technical and challenging just begins to describe them. The climb is long, but steady, and the surface of trails like 3G, Repeat Offender and Community Service has this amazing quality. Even in the damp and greasy weather there is grip for days. 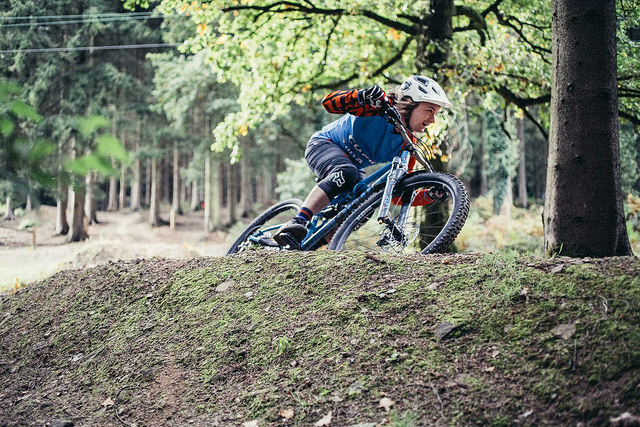 Your tyres seem to hook into the ground giving you great feedback, and allowing you to trust the bike and know that you will make it round the catch berm at the bottom of the chute you're sliding down. I've been back since, and I'll be back many more times in the future. What a place. Check out No.1 Peebles Road for great coffee and scran, and a pint of Tempest Brewery ale in the Traquair Arms after your ride if you're in the valley. One of my highlights of last year was riding the trail centre in Gwdyr Forest just down the road from Betws y Coed in North Wales. This summer I had another open demo there, but the highlight this year was meeting a local rider for an exclusive demo on the Friday before. I can't go into too much detail about the route we rode, as it was definitely off the trail centre. But what I can say is how awesome the main descent we rode was! 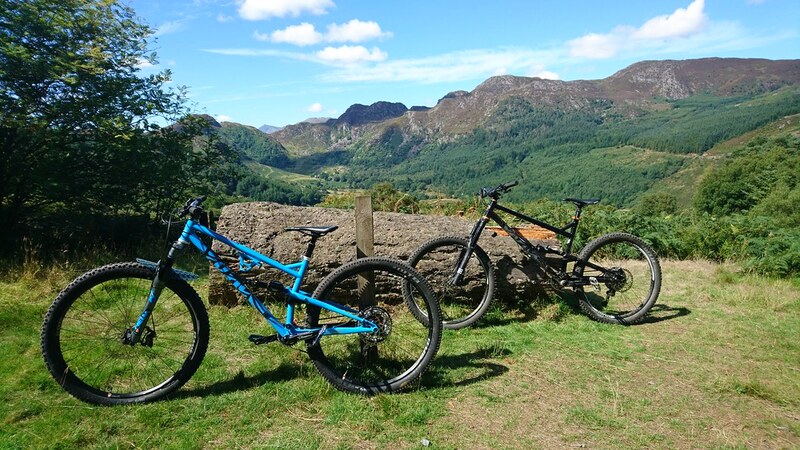 A mixture of flat out and loose surface, woodland singletrack, tight steep corners and some natural jumps made for a classic descent on a beautiful summer's day. Later that weekend I rode with Matt from Kingud, who supply us with their great range of bike care products to keep the demo fleet shiny. Him and his mates took me down some of their secret trails in the woods above Betws, which was another eye opening ride! Proper winch and plummet stuff, with no need to pedal on the way down. Keen for more of that next year. The day after the hectic Steel is Real demo day, we organised an owners ride in the Forest of Dean. If you've not been to this classic UK riding destination, you really must, and I strongly recommend you do what we did, and get yourself a local guide to show you round. Paul from FoDMTB was our man, and he treated us to some sublime singletrack. 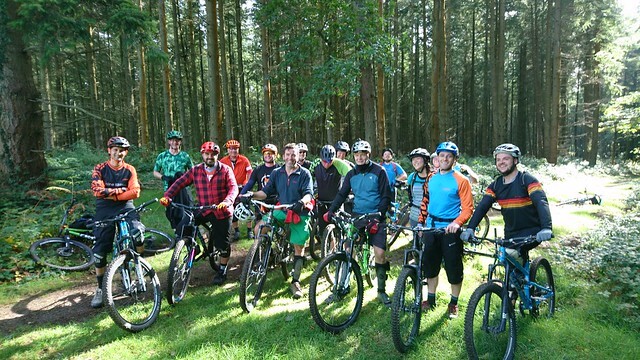 With 16 excited Cotic owners, we rode a great mixture of fresh cut loam, leafy trails and some incredible berms interspersed with fun stump jumps and roots. We barely touched tarmac or trail centre, and there's no way we could have found these trails without expert local knowledge. It was a lovely way to clear the head after the busiest demo of the year, and the weather was infinitely better too. Cool, clear and sunny; far better than the driving rain of the day before! 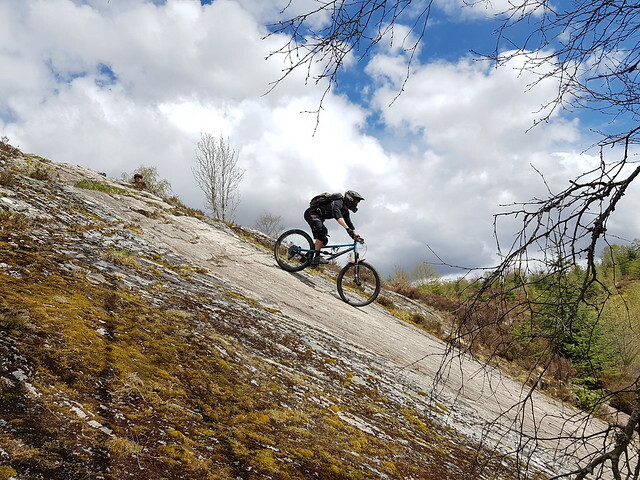 We hired Paul through Pedalabikeaway at the Cannop Cycle Centre, give them a shout to book your own guide, its well worth it if you want to explore beyond the trail centre. Keep an eye out for more owners rides in 2019, they book up fast. This was a brilliant day in the 'office'. Me, Cy, Paul, Hannah and Rich grabbed a load of hardtails from the demo fleet on a bright, dry Autumn day and headed for a lap of our demo loop to shoot a video. We spent ages scoping lines and shooting clips of each of us skidding through the piles of crispy fallen leaves, or hitting sketchy jumps and drops. Each of us was grinning from ear to ear, all detached from the usual responsibilities by the simple pleasure of riding a hardtail in the sunshine. I'm hoping for more rides like this next year. If you haven't already, check out the video at the bottom of this news post, Baybutt did a great job of capturing the vibe. I must add an honourable mention to the two most entertaining demo customers of the year, Alex and Ralph. These two German gents came to Ard Rock and joined for a few demo rides and hung out with us on the stand. Ralph's mixture of German efficiency and Irish sense of humour is thing to behold, hopefully we see them again at next year's Ard Rock. For 2019, I'm aiming to keep the pedal to the floor with the demos, after a bit of a rest in January. What I need though, is for you guys to tell me where you want to demo a Cotic. I'll definitely be returning to the popular spots like Cannock, Forest of Dean, Peaslake and Glentress, but if there's a location you'd like to test out a bike or two, please get in touch and let me know. Anywhere in the UK, I'll do my best to get something sorted. I am hoping to get over to Northern Ireland again next year, so I'm open to suggestions for possible venues there. I'm also hoping to do a bit more riding outside of the demo tour, for various reasons this year I've not managed to get out my bike socially as much as I'd like, so here's to a bit more playing in 2019. I've got myself an entry to the Naughty Northumbrian Enduro in August, so I've got some training to do if I want to enjoy that! Have a wonderful Christmas, I hope Santa brings you everything you want, and I hope you manage to get out and pedal off the Christmas dinner over the holidays. 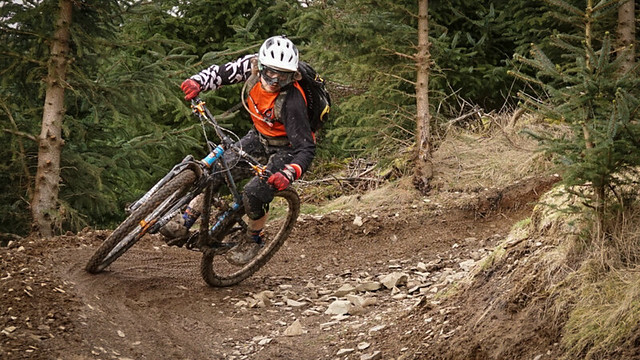 Weather permitting I'm off to Llandegla for a festive family shred on Boxing Day. See you in the new year!